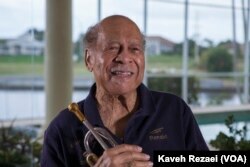 Born in 1925 in Thibodaux, Louisiana, just west of New Orleans, Richard’s memories of childhood are filled with music. His father played piano by ear. His uncles and cousins all played instruments and sang. So, at the age of six, Richard started piano lessons at home. At the age of 13, Richard went to see a band perform at a church dance. He noticed two young trumpet players in the band. He says they were dressed “clean and sharp.” All the girls -- including his girlfriend -- fell for the trumpet players. Richard knew he had to take action. Richard played the trumpet in the high school band. After high school, the government sent him into military service. 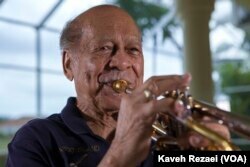 He played his trumpet during his time in the United States Navy Band. Later, he performed while touring in a USO variety show. “First of all, to be selected by Ray Charles was an honor to me. I was honored by that and a little nervous,” says Richard. In time, Richard became Charles’ bandleader. Ray Charles was exacting, says Richard, and he demanded the same from band members. Richard toured all over the South and West with Ray Charles. Sitting in the back seat of the car on the way to a gig, Richard wrote the song “I Got a Woman” for Charles. It became Ray Charles’ first number one radio hit. The song put Ray Charles on the map. In 1954, Renald Richard left Ray Charles band. He was upset by the drug problems among band members. Richard retired from teaching in 1991. Living now in Southern Florida, Richard still plays his trumpet with the Marco Island Strummers and with the Jazz Masters in Naples.